PEN America is thrilled to announce the finalists for the 2019 PEN America Literary Awards. Our awards are juried by panels of esteemed, award-winning writers, editors, booksellers, and critics. Learn about the PEN America Literary Awards judges here. This year’s awards will confer more than $370,000 to writers and translators whose exceptional literary works were published in 2018. 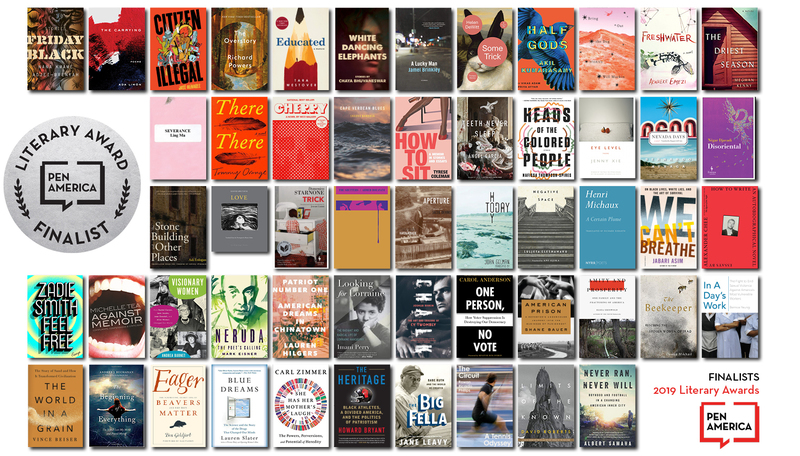 Spanning fiction, nonfiction, poetry, biography, essays, science writing, sports writing, translation, and more, these shortlisted books are bound to help fill your 2019 TBR. Stay tuned for further announcements about winners of the following awards: PEN/Nabokov Award for International Literature, PEN/Osterweil Award for Poetry, PEN/Dau Short Story Prize for Emerging Writers, PEN/Pels Theater Award, PEN/Magid Award for Excellence in Editing, PEN/ESPN Lifetime Achievement Award. The winners will be celebrated at the 2019 PEN America Literary Awards Ceremony on February 26 at the NYU Skirball Center in NYC. For a book-length work of any genre for its originality, merit, and impact. To an author whose debut collection of short stories published in 2018 represents distinguished literary achievement and suggests great promise. For an exceptional debut novel published in 2018. To an exceptional book-length work of any genre by an author of color, published in the United States in 2018. For a book-length translation of prose from any language into English published in 2018. For a book-length translation of poetry from any language into English published in 2018. For a book of essays published in 2018 that exemplifies the essay form. For a distinguished biography published in 2018. To honor a distinguished book of general nonfiction published in 2017 or 2018. For a book that exemplifies literary excellence on the subject of the physical or biological sciences and communicates complex scientific concepts to a lay audience. To honor a nonfiction book on the subject of sports published in 2018.